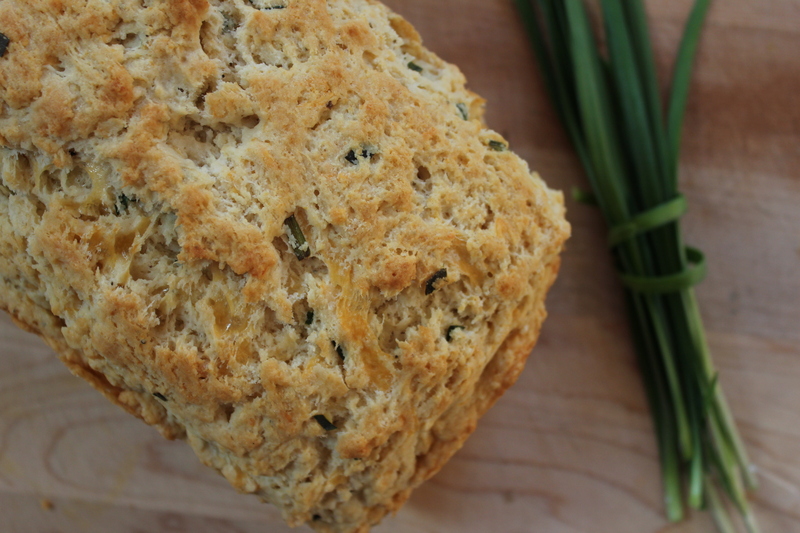 Cheddar Chive Beer Bread is moist, cheesy, oniony goodness with just the right amount of tang from the beer. A quick brush of butter over the top before baking makes for a crunchy buttery crust. Any kind of beer will do. I have made this with everything from a light pale ale to a rich Guinness. Keep in mind that the more flavorful the beer, the more of the beer taste will come through in the finished loaf. The alcohol however cooks off in the process, so do not hesitate to serve this up to the kids. My kids love it! Preheat the oven to 375 degrees. Butter a 4 x 8 inch loaf pan. Whisk together the flour, cheese, chives, sugar, baking powder, salt, and ground pepper. Stir in the beer and 4 tablespoons of the melted butter. Spoon the batter into the prepared loaf pan. Smooth the top with a spatula. Brush the last tablespoon of butter over the top and slide the loaf into the preheated oven. Bake for 40-50 minutes or until the top is lightly browned and a toothpick inserted in the center comes out clean. Allow the bread to cool in the pan for 10 minutes on a wire rack. Then run a knife along the inside edge of the pan to loosen the loaf and turn it out. Place the loaf back on the rack and let cool for another 30 minutes or so before slicing. This looks wonderful. I love fresh bread out of the oven – nothing much better! Sound great, we’ll be having it tonight with our corned beef dinner! Yum! Happy St. Patrick’s Day, Cathy. Yay! This beer bread looks so classic and delicious. I may just have found a use for the chives that have been poking their heads up in my yard! I can’t wait for our chives to pop up! What a marvelously delicious loaf, Karen. Chives and cheddar are so good together! Happy spring to you! Could you use this recipe in muffin tins?